It started with a deer. Or more accurately, it started with the deer sprinting out into my lane, then trampolining off the hood in series of slow motion loops en route to the ditch. And when the body shop messed up the the timing for parts, the plan to drive out to Washington went up like the steam from the smashed radiator. Before two months ago, the only things I really knew about El Cap were: the Dawn Wall was over-publicized, Tommy Caldwell is a god, and anyone who climbed the Nose in a day was insane. Yosemite was a place you went to when you had mastered the routes at your local crag and were bored by the lowly grade of 5.12 trad. I didn’t think of it as attainable for my climbing. I didn’t even think about it as a place I was allowed to go. I had just gotten back from seven months of backpacking in South America when my two best friends told me they had an outlandish goal: to try to climb El Cap in the fall. I’m not gona lie: I love this pack. 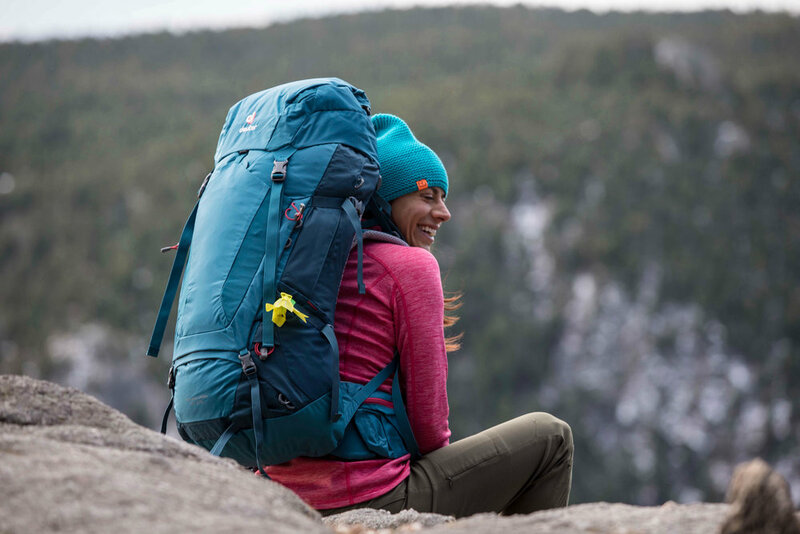 Backpacks aren’t a thing I normally get excited about, but Deuter’s Gravity Motion is amazing. The amount of attention paid to the details blows my mind. Safety is on the Cuff: All it takes is one. I cannot stress enough, the importance of having a mentor for the sport of rock climbing. With the explosion of climbing and the increased risks of accidents, injuries and even fatalities, a weekend trip out with a guide is not enough to consistently practice and dial-in skills and practices that are mastered over the years. I’m seriously stoked that I have found a pack that I feel so free in. I brought this pack out for it’s maiden voyage on a 6-pitch route and I couldn’t have been more satisfied with its performance. It just didn’t impede on my climbing abilities in the slightest. Since then, it has been with me on every multi-pitch route I’ve done. As I scanned underneath the chairlift for fresh turns a sweet little chute caught my eye. “I want to ski that one!” I thought to myself. I was in the middle of my second day skiing in Utah at Salt Lake City’s own Solitude Mountain Resort. I hopped off the chairlift and proceeded down to the entrance of the line I had spied. I took the top turn throwing up a cloud of the classic Utah fluffy stuff, dropped in, caught the transition perfectly and aired out the bottom of the chute. Wow, that was smooth! I took the exit turn, a nice arcing left-hander fully expecting to be deposited into the all-too-familiar white room. Too late, I was not where I thought I was. A traverse track that I had not noticed during my viewing of the line appeared in front of me and I was instantly folded, my right ski ejected. I immediately knew my right knee ligaments were shot. I managed to gather my right ski, thanks to a concerned onlooker, clicked back in with a grimace and a whimper and ripped down one-footed to assess the damage at the on-hill emergency clinic. “Looks like a Grade II MCL and Meniscus tear,” the doctor told me. My knee was already the size of a watermelon, and I had to go back to work the next day. Just like that, my ski season was over. I had to hang up the skis and get on the healing train. The first question I get is Why? Why compete? Isn’t it better to focus on climbing outside? And, why try to compete with today’s youth who are seasoned competitors, some competing for most of their lives? Climbing is a painful sport. Our toes are constantly snuggled against leather or synthetic boxes that smush our toes. Climbers feel pain the way ballerinas feel pain, not during performance. It before and after. How do we take care of our feet? My first thoughts on this pack were about the overall structure. Would it hold up on a Yosemite Big Wall? So naturally I took the pack down to the Yosemite Valley, where rock climbing dreams are made. People call me the Ice Queen, but the nickname is only 50% due to my personality. The other half is because I am pretty much always cold. When others say 'sending temps' on a sunny January day in Washington, I'm the one who's still got hand warmers in my chalk bag dreaming of summer. So even though I’m a boulderer at heart, I have been getting out on ropes the last few weeks, which means I got to trade in carrying my crash pad for my new Deuter Guide Lite 32 backpack!